1. General Introduction to Robustness. Introduction. Application Areas and Related Robustness Questions. Statistical Methodology. Recommended Reading Paths. References. 2. Stability and Response Surface Methodology. Introduction. An Overview of Response Surface Methodology. Robust Design and Response Surface Methodology. Split–plot Designs for Robust Design. Conclusions. Acknowledgements. References. 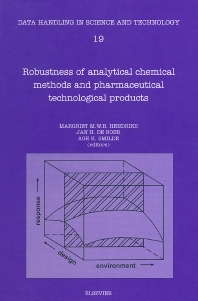 3. Review of the use of Robustness and Ruggedness in Analytical Chemistry. Introduction. Place of Ruggedness Testing in Method Validation. Definitions of Ruggedness. Ruggedness Testing of Procedure Related Factors. Ruggedness Testing of Non–Procedure Related Factors: The Use of Nested Designs. Conclusions. Acknowledgements. References. 4. Robustness Criteria; Incorporating Robustness Explicity in Optimization Procedures Utilizing Multicriteria Methods. Introduction. A Brief Introduction to the Taguchi Methods. The Robustness Criteria. Multicriteria Decision Making. The Robustness Coefficient Applied in a MCDM Strategy. References. 5. Ruggedness Tests for Analytical Chemistry. Introduction. Selection of Factors to Test. Selection of Experimental Designs. Treatment of Results. Example Case Studies. Conclusions. References. 6. Stabilizing a TLC Separation Illustrated by a Mixture of Several Street Drugs. Introduction. Theory. Experimental. Results. Conclusions. References. 7. Robustness of Liquids–Liquid Extraction of Drugs from Biological Samples. Introduction. Theory. Experimental. Results and Discussion. Conclusions. Acknowledgements. References. 8. The Use of a Factorial Design to Evaluate the Physical Stability of Tablets after Storage Under Tropical Conditions. Introduction. The Use of the Relative Change in Tablet Paramaters in a Factorial Design. Selection of Excipients Suitable for use in Tropical Countries. References. In analytical chemistry and pharmaceutical technology attention is increasingly focussed on improving the quality of methods and products. This book aims at fostering the awareness of the potential of existing mathematical and statistical methods to improve this quality. It provides procedures and ideas on how to make a product or a method less sensitive to small variations in influencing factors. Major issues covered are robustness and stability improvement and ruggedness testing. General strategies and a theoretical introduction to these methods are described, and thorough overviews of methods used in both application areas and descriptions of practical applications are given. • Gives ideas on how to use methods in practical situations. The book is intended for those who develop and optimize, and are responsible for the overall quality of, analytical methods and pharmaceutical technological products and procedures.